TORONTO, Feb. 14, 2013 /CNW/ - TD Bank Group today celebrated 10 years of support for Canadian music with an in-branch concert at its flagship King and Bay branch. A longtime supporter of community initiatives that create access to music for young people, TD has proudly been bringing music to Canadian communities since 2003. Every year, TD has shared its love of music with communities and customers by sponsoring 60 major music festivals from coast to coast. "As the Bank of Music, we are thrilled to celebrate our 10-year milestone of support for Canadian music with a special concert featuring some of the country's brightest talents," said Chris Stamper, SVP of Corporate Marketing, TD Bank Group. "This year, we look forward to bringing special music experiences to fans across the country; and to helping young people discover a love of music." To celebrate this special anniversary, the TD Music programme staged the "For the Love of Music" event. Artists from a range of musical genres performed love songs at an acoustic concert hosted by and starring Jully Black, and featuring Eva Avila, KAI, Devin Cuddy and Karl Wolf. Each artist serenaded the audience with two of their favourite love songs. Artists spoke about the importance of corporate support in contributing to the development of Canadian musical talent and engaging the next generation in music. Allan Reid, Director of MusiCounts, echoed this sentiment, "With TD's support, we are moving closer to our goal of ensuring that all children in Canada, regardless of socio-economic circumstances and cultural background, have access to music education programs." 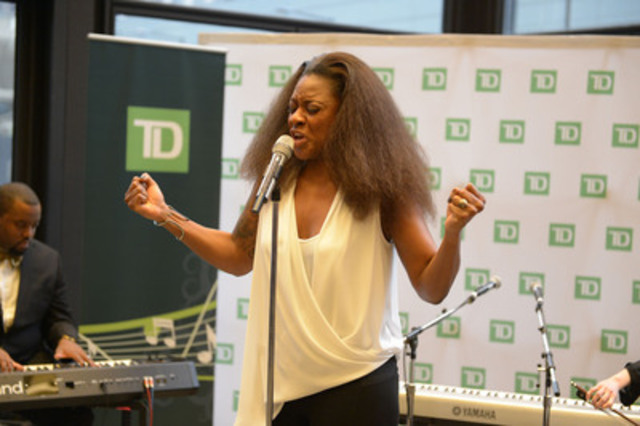 TD's decade-long involvement with music began with its sponsorship of world-class music festivals in cities across the country. TD has also, for many years, supported outreach programs for youth via music workshops, educational initiatives, awards and scholarships. TD supports MusiCounts, Canada's music education charity associated with the Canadian Academy of Recording Arts and Sciences (CARAS). And as a National Sponsor and the Official Bank of the 2013 JUNO Awards, TD encourages music lovers to cast their vote for the 2013 JUNO Fan Choice Award presented by TD. TD is also the official bank partner of Live Nation, and invites music fans to enjoy Live Nation's year-long concert series with peak activity at the Molson Amphitheatre between May and September 2013. Music fans can keep up-to-date on all TD Music initiatives and events by visiting www.TDLiveMusic.com. Since 2003, TD has helped customers and communities experience the love of music by sponsoring major music festivals across Canada. Each year TD supports many music-based community and educational programs. Continuing with its commitment to support music programs throughout Canada, TD is a proud National Sponsor the 2013 JUNO Awards and Live Nation's year-long concert series.